Valley’s Bre Call handles the basketball during the first half of Thursday’s contest against Waverly. Waverly’s Paige Carter shoots during Thursday’s 52-48 overtime win over Valley in Lucasville. Waverly’s Kami Knight competes with Valley’s Nichole Gilliland for a rebound during the second half of Thursday’s contest. LUCASVILLE — Four in a row and six of seven. It’s safe to say Waverly is on a tear. 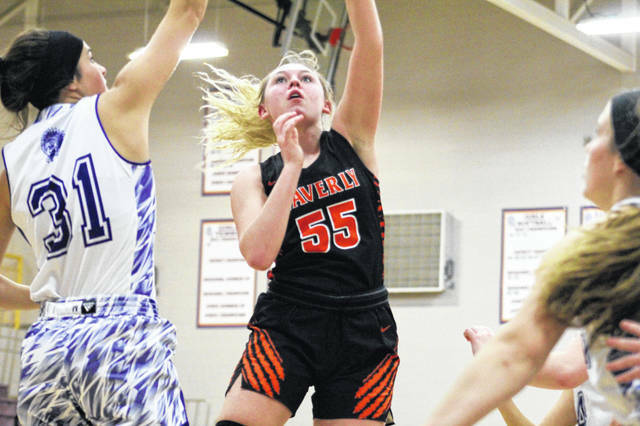 The Tigers, who have had their struggles this year in conference play, got a key road win Thursday night in a 52-48 overtime decision at Valley. Earlier in the season, the Indians traveled to Waverly and handed the Tigers (10-5, 5-5 SOC II) a 59-41 loss. From that factoid, you can infer how much Thursday’s win meant to coach John Bonifield’s team. The game took on a tournament-like atmosphere … physical, a sense of urgency on both sides and down to the wire. The physicality is what Bonifield noted as helpful down the stretch for his team … after all, in Division II, Waverly could match up with a number of bullies. Leading Waverly’s charge was undoubtedly Kami Knight, Zoiee Smith and Paige Carter. Knight had a game-high 18 points, Smith stuffed a balanced stat sheet as usual and Carter was relentless cleaning the glass. Combined, the trio scored 43 of the team’s 52 points. Carter got the night’s scoring started with 6:54 left in the first quarter before Zoiee Smith capped a 10-3 game-opening run with two free throws at the 3:47 mark. After Valley took a timeout, the Indians (8-8, 5-6 SOC II) fought back as Bre Call and Karsyn Conaway narrowed the gap to 14-9 after one. In the second, Valley’s momentum continued to get a boost from Call and Conaway, as well as Brooklyn Buckle, who gave her team its first lead 17-16 with 5:22 to play. The Tigers, however, regained the lead thanks to a three-point play from Knight with 1:55 left before taking a 26-25 edge into halftime. After the break, the nip and tuck style of play continued. Valley went on a quick 4-0 run to take a 29-26 lead before Carter put the Tigers back on top, 33-32, with 36 seconds left to play in the third. Carter scored again to make it 35-32 before Waverly took a 37-34 lead into the fourth. With 4:30 left in the final eight-minute period, Call tied the game 42-42 with a 3-point field goal. That led to the two teams trading baskets and free throws down the stretch before the game headed into overtime at 46-46. In the extra four-minute time frame, Conaway gave the Indians a 48-46 lead with 3:35 to go. But her score was answered by a 6-0 run from the Tigers — one that included a bucket from Smith and 4-of-6 shooting from the free throw line via Knight and Smith. Kami Knight led the Tigers with 18 points while Carter added 13 points and 14 rebounds. Smith finished the night with 12 points, six rebounds and six assists, and Carli Knight had five points and eight rebounds. 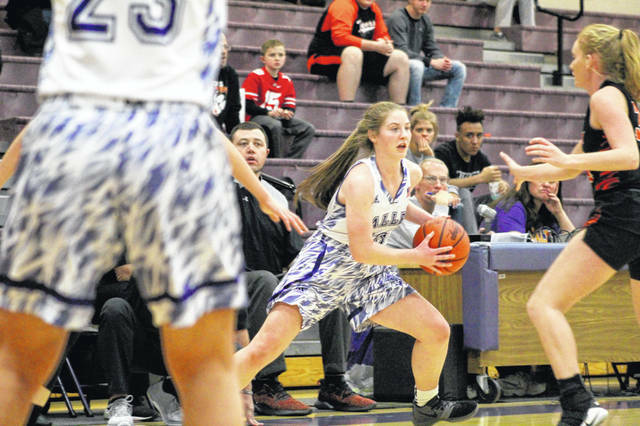 Valley was led by Conaway, who scored 16 points and added four assists. Buckle added 11 points while Call finished with nine points, 10 rebounds and five assists. Kaity Howard also chipped in, scoring four points and grabbing a team-high 11 rebounds. 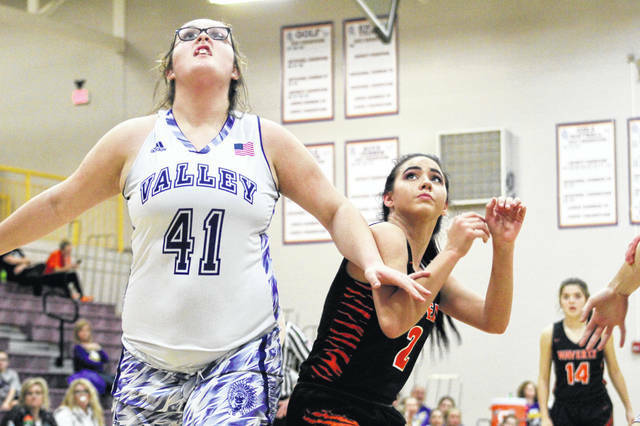 Valley gets back to action Saturday, taking a trip to Frankfort Adena, while the Tigers travel to Hillsboro for a non-conference matchup Monday. Waverly: 17-55 FG, 18-33 FT, 0-9 3pt. Scoring: K. Knight 18, Carter 13, Smith 12, C. Knight 5, Collett 3, Brown 1. Valley: 21-59 FG, 2-14 FT, 4-22 3pt. (Conaway 3). Scoring: Conaway 16, Buckle 11, Call 9, Howard 4, Day 4, Hettinger 2, Gilliland 2.
https://www.portsmouth-dailytimes.com/wp-content/uploads/sites/28/2019/01/web1_Call-1.jpgValley’s Bre Call handles the basketball during the first half of Thursday’s contest against Waverly. https://www.portsmouth-dailytimes.com/wp-content/uploads/sites/28/2019/01/web1_Carter-1.jpgWaverly’s Paige Carter shoots during Thursday’s 52-48 overtime win over Valley in Lucasville. https://www.portsmouth-dailytimes.com/wp-content/uploads/sites/28/2019/01/web1_Knight-1.jpgWaverly’s Kami Knight competes with Valley’s Nichole Gilliland for a rebound during the second half of Thursday’s contest. Reach Derrick Webb at (740) 353-3101 ext. 1930, by email at dwebb@aimmediamidwest.com, or on Twitter @dw1509.